If John know M4VGear before, he will not meet such trouble. M4VGear DRM M4V Converter works as a charming iTunes M4V Converter that helps people easily convert iTunes M4V to AVI, MP4, MOV, FLV, WMV, MP3...format video. And it works on both Mac and Windows platforms. Not like other common video formats, the M4V videos from iTunes store can only be played on iTunes or recognized by Apple devices such as iPad, iPhone, iPod. The Fairplay DRM protection added in iTunes M4V by Apple Inc stops you from copying, spreading, or editing them when downloaded from iTunes store. 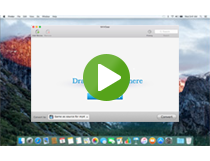 Click "Add Movies" button to choose the iTunes M4V videos you want to convert to AVI format. 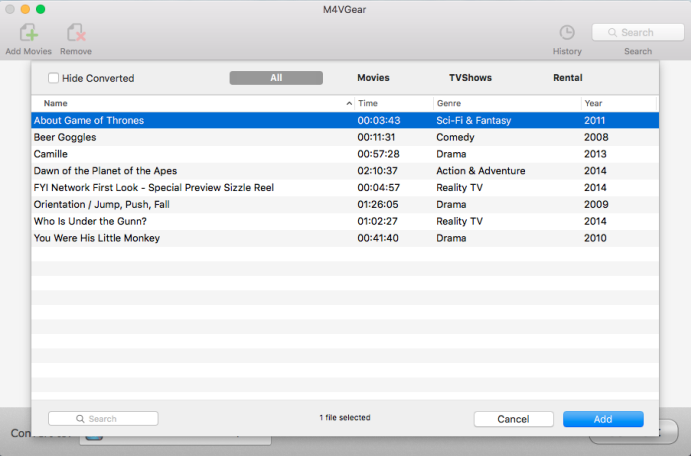 M4VGear would automatically detect your iTunes library, so it is easy for you to select the iTunes M4V files you want. After clicking "OK", the selected videos will appear on the panel of M4VGear. Check the iTunes M4V videos on the M4VGear panel and choose the output format as Customized AVI Video from the output profile located on the bottom left. Or you can select it by clicking the format icon on the video. Click "Convert" button on the bottom right, then there will be a pop up window to show you the conversion process. Please note: during the process, do not control iTunes. When conversion is finished, the output folder will be opened automatically and you can find the AVI files that are converted from iTunes M4V videos there. The process is quite the same as the Mac version does. With simple three steps, you are able to convert iTunes M4V to AVI easily. The M4VGear for Windows is compatible with Windows XP, 7, Vista, 8 and the latest Windows 10. The latest iTunes version is also supported. The AVI (Audio Video Interleave) format is one of the oldest video formats. It is so universally accepted that many people consider it the de facto standard for storing video and audio information on the computer. Due to it’s simple architecture, AVI files are able to run on a number of different systems like Windows, Macintosh, Linux; is also supported by popular web browsers. 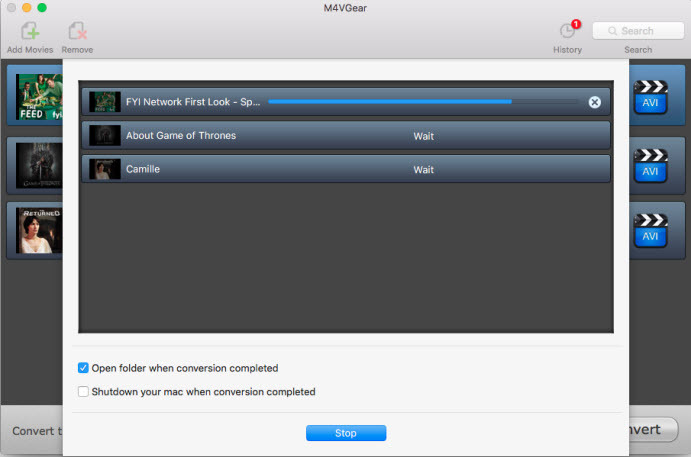 By using M4VGear DRM Media Converter, you are able to convert iTunes M4V videos to AVI format for widely playback. Note: M4VGear offers you a one-minute free trial to test out. To unlock the limitation and get free life-time update, we strongly suggest you to use the full version. M4VGear now can be bought at $44.95, which is 10% off from original $49.95.